David Beckham's Major League Soccer franchise will be called Inter Miami CF, it has been announced. The club, owned by the former Manchester United player's company Miami Beckham United, unveiled their new name and logo with a video on Twitter. "Four years ago, we dreamt of a soccer club. Today, we're proud to announce the official crest of that club. Join us on a journey that has only just begun," it said. The full name of the team will be Club Internacional de Fútbol Miami, to symbolise the strong Spanish-speaking community within the population of the Florida city. The club's motto "Libertas, Unitas, Fortuna" pays tribute to the concepts of freedom, unity, solidarity, inclusiveness, opportunity and good fortune for all. 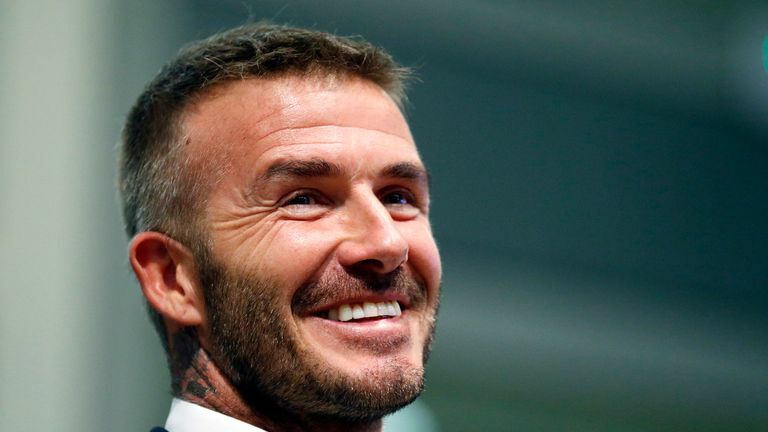 "We are a new team but we are a city with a lot of history and I think that's what we wanted to create with this crest," said Beckham to SNTV. "But also, the authenticity, the South American flavour that we wanted in there. We also needed that modern twist as well because that's what Miami is all about. "I know that we have created something that our fans are happy with, I just hope that we've created something that everybody will be happy with." Managing owner Jorge Mas added: "Our city and our fans draw their strength from the dreams of a global population that calls Miami home. Beckham announced his plans to form an MLS franchise in January and the club will officially start competing in the American top flight in 2020. Inter Miami CF has yet to find a home and in November the city's voters will go to the polls for a referendum on a no-bid lease to build the club's stadium for a reported $1bn.